This biopic about several rappers out of a south LA suburb turned out to be a compelling movie. It provided a good general picture of the rise and fall of the N.W.A. and the West Coast rap scene. 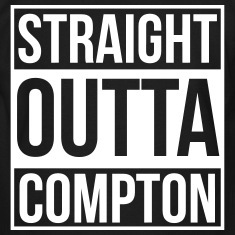 The movie did run a little long, which could be an issue for those who are uninterested or uninitiated to rap and its history. Also, the party scenes, while not to the level of The Wolf of Wallstreet, were overly gratuitous at times. Towards the end of the movie, you could tell how much influence Dr. Dre and Ice Cube had over it. They were the two most generously portrayed characters. I hesitate to say that biographical films shouldn’t be made until involved parties are deceased. While there is a lot of potential for meddling and awkward moments of “they represented me badly,” perhaps its for the best. It prevents a completely embellished and inaccurate portrayal for the sake of maximizing entertainment. Movie-goers should continue to take these things with a grain of salt. What you can’t deny is that a couple of guys with little to no hope made it out their hometown in a big way. Overall, I would recommend everyone give this movie a try. It was well-written and quite interesting.